Choose exactly what you need from a variety of convenient bundles or individual reports. Free, Online Rental Application is quick and easy for your prospective tenants to complete on any device. It only takes minutes to begin screening your applicants. With no minimum and no sign-up fee, you can quickly access valuable information about a potential tenant. Tenant Score, available in the Premium packages, provides a three-digit number that predicts the likelihood of lease default. Tenant Score PLUS takes it one step further by allowing you to see accept/decline percentages by other landlords in your region for applicants with the same tenant score. 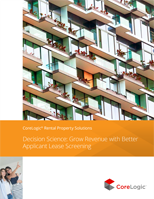 Order these helpful tools and get valuable information that aids in the tenant selection process. Does not require credit consentThis product does not require credit consent. You must provide the applicant’s First, Middle and Last Name, DOB, SSN, Monthly Income, and Current Address. The report is typically generated immediately. Requires credit consentThis product requires consumer consent. You must provide an email address for each person listed on the application so that we can send them a link to complete a secure credit authorization process.